What are Vents and when do you need them? Vents allow airflow in and out from under your cover. As night turns into day, condensation can occur on the underside of your cover - just as a glass of cold water gets condensation on the outside of the glass. Vents allow airflow underneath the cover to dry up the condensation and minimize mildew. 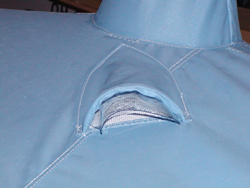 The vent hood is made of boat cover material with screening underneath to keep critters out. Vents are placed so they face downward, so rain does not flow in, and slightly toward the aft end so air does not rush in and lift the cover while traveling. Our "Mooring" style covers already have a vent in the front and back of the cover, so generally you do not need to add vents. Acrylic covers are breathable (the entire cover is breathing) therefore, usually, you do not need vents. However, polyester army duck material is not breathable, and our "Trailing-Mooring" design does not have vents built into the cover. If you are in the South where you get a lot of heat build up, you may want to add two vents to your poly Trailing-Mooring. If your boat is made of wood, vents are recommended because wood needs to breathe. See Chart. Vents are $12.00 each installed. 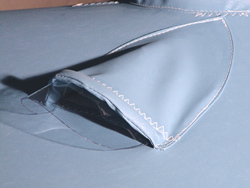 If you store sails under the cover, vents are recommended in order to dry out the sails.